Ms. Merill Jean A. 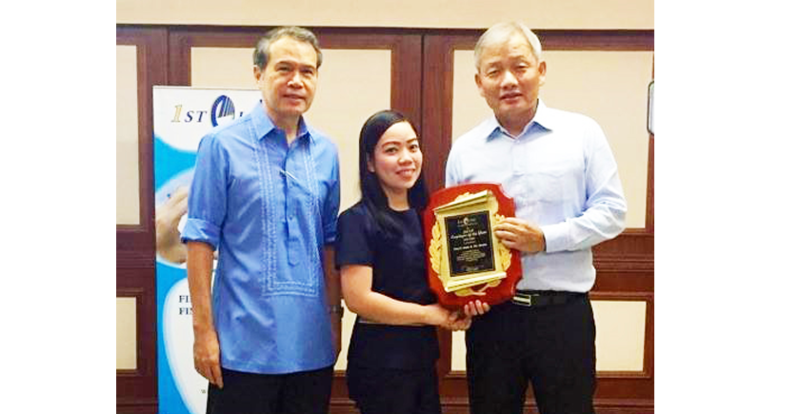 De Jesus, or “Merill”, First Life’s Group Insurance Assistant, was recently named as “2015 Employee of the Year (EOY), the company’s most prestigious award for employees. Believing that human resource is its most important asset, First Life continues to provide numerous avenues for employee development where a strong track record in the areas of work ethics, building positive relationships and contribution to productivity is recognized and celebrated by the entire organization. Ms. Merill is a Registered Nurse by profession, an ALMI (Associate Life Management Institute) achiever in 2014 and an Annual Perfect Attendance Awardee in 2015. She has been with First Life since 2012. Now on its 14th year, the award continues to motivate and give credit to all the hard work and dedication of First Life Employees.